Awhile ago I think somebody posted a question about smoke level adjustment (I think it was here). I hadn't heard of them at that time. Yesterday, I ran across a reference to 'smoke level adjustment' in my Ford 1710 repair manual. The manual doesn't say what it does or describe an adjustment. However, the adjustment screw is located on the timing gear cover, above the housing for the injection pump gear. From the position of the adjustment, I'd guess it has something to do with the pump gear backlash, or maybe the governor linkage. It's curious that there seems to be no mention of the adjustment in any of related assembly/repair sections or in trouble shooting remedies. Adjustments in assembly sections almost all require shimming. 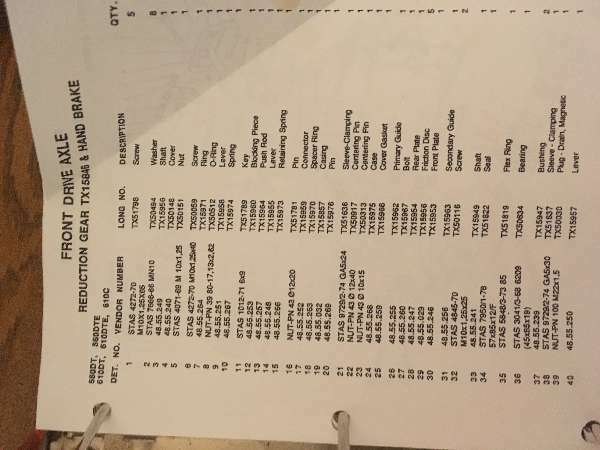 There is a note not to disturb the adjustment in the section on timing gear removal. From all this, I'm guessing that the adjuster may affect one of the tolerances that are set by shimming during assembly, and the adjustment is provided so to allow a mechanic to re-set tolerances without having to do the tear-down required for shimming. However, it seems certain that the use of adjustment is intended only for factory trained and equipped mechanics. Just a thought but I would try to have a dyno to see what it does to the horsepower of the tractor. Less smoke could be timing and might mean less horsepower. The smoke level adjustment sounds like what is commonly called turning the injector pump up. It increases the volumn of fuel injected giving the tractor more power to a point. Years ago ag tractors were overbuilt & could handle more power. It is best to leave that kind of adjustment to someone that has a dyno & knows the proper settings. Well, here I am grasping at basic diesel engine concepts. I hope my meandering, or responses to them, help somebody. I mostly am trying to come to grips with the idea of fuel/air mixture in a diesel engine. Unlike gas engines, diesels have no throttle valve to change intake vacuum, which varies the amount of oxygen going the cylinder. I believe that rpm in a diesel is determined entirely by load and fuel delivery. Simply pumping more fuel may have the effect of increasing rpm rather than making a 'richer mixture.' In addition, I believe that injectors continue to supply fuel even after ignition starts. Basically, I'm not sure that fuel/air ratio concepts are quite the same between gas and diesel engines, and I probably think of them in terms of gas engines. The adjustments I know about for injector pumps are throttle, timing and spill time. As far as I know, timing is a gross matter of matching up marks of the drive gears to mesh the 'right teeth.' Spill timing seems to affect exactly where in a piston stroke injection starts and may set a point of maximum injection duration as well. Throttle seems to affect the duration of injection, but may affect fuel pressure as well. If I've got the idea of an injector pump right, they work by varying the location of ports along the length of a pump cylinder: Basically, a port open, which allows fuel to flow into a chamber. The port closes and the pump piston rises, which closes the port and starts pressuring the fuel. A port opens, which delivers pressurized fuel to an injector through a supply delivery control valve. Fuel delivery continues until another port opens, which releases remain fuel back the low-pressure part of the pump and stops injection. I may not have this all right, but if I do, I'm not exactly sure what the smoke level adjustment affects. Maybe somebody's has a concise description of this stuff. I have precisely the same problem with my TC33D. I just replaced the injectors and I am getting very heavy black smoke upon startup and throttle up. Can you tell me where this smoke screw is located? I would be grateful if you could send me a copy of page regarding the adjustment (location/specifics of the adjustment). The grass has been growing like crazy and I have to get this up and running. Burt that was 11 years ago.